The lip balm brand, EOS, has recently come under fire from the FDA, in addition to a large group of angry consumers who have filed a class action lawsuit claiming the Easter egg-resembling balms caused severe adverse skin reactions. I was more than a bit surprised when I saw that beeswax was called out by dermatologists as the main suspected culprit, claiming that one of the components of beeswax, propolis, has been linked to skin reactions. Beeswax has been used successfully for centuries in topical herbal salves and balms, as well as in natural skincare products. What is really causing the allergic reaction to EOS lip balm? I’ve spent years formulating skin care, so when I read the EOS Lip Balm ingredients, I found some highly suspect skin-irritants which would be much more likely to cause such extreme allergic outbreaks. And based on what my happened to my little girls when their lips had a similar reaction to those in the class-action lawsuit against EOS, I think there’s a lot more to uncover about this “natural” brand here. To be clear, I did not do formal scientific testing on these products (but probably neither did EOS or they wouldn’t be getting sued by so many people). EOS claims to use 99% natural ingredients, but in reviewing the ingredient deck, the big red flag I saw was “natural flavoring” among the top five ingredients on the list. Anytime an ingredient is that high on the list, it means that a high percentage of it was used. A high concentration of natural flavoring means a high concentration of a lot of potentially irritant ingredients. A single flavoring additive can contain hundreds of individual components, any of which can can cause a potential reaction. Labeling laws do not require these individual ingredients to be disclosed, so there’s no way to know the product contains something a consumer is allergic to. Yep – it’s true, and so frustrating that consumers are duped over and over by this term. As a formulator myself, I know that “natural” doesn’t always mean natural when it comes to flavorings and fragrances. Many of the additives and perfumes to used to make natural flavoring contain synthetic components. Many of the expert commentators in the press release and articles stated that more than once as a rebuttle. They love using poison ivy as a classic example. Sure that’s true: natural isn’t necessarily safer, but there’s more to it than just that. When a lip product smells and tastes like candy, people are even more likely lick their lips. Saliva contains enzymes which are meant to break down substances as part of the digestive process. Too much saliva, mixed with other potentially irritant ingredients on the lips, causes chemical exfoliation to occur, which is too harsh for the delicate lip area. The FDA did point to overuse as one of their biggest concerns, because the packages are not labeled with any cautions or usage guidelines associated with frequency or amount. Constant, and thick re-application of a product that contains even a small amount of one irritant or allergenic ingredient is obviously a bad idea. I also noticed that the products contain Vitamin C, which can be skin irritant and is photosensitizing (i.e. has a bad reaction in the sun). Plenty of people slather on lip balm when out in the sun, but if that lip balm contains photosensitizing ingredients like Vitamin C, the lips are at increased risk of damage from UV radiation. Though coconut oil is loved by many, it’s not good for everyone. For many with already dry or sensitive skin, applying it can cause increased dryness and sensitivity if it’s not properly absorbed (and dehydrated skin often has absorption issues). Inadequate absorption (or simply applying too much in the first place) can cause the coconut oil to form an occlusive layer on the surface, which can suffocate and also potentially drive other irritant ingredients further into the skin. Coconut oil is also considered a tree nut, therefore the EOS lip products should have been labeled as containing tree nuts, which they did not, as noted by the FDA. My children received EOS lip balms in their Christmas stockings (from a relative) this year, and after reading the ingredients, I let them enjoy the balms they got for Christmas; though I did have to stop them from overdoing it on numerous occasions (apparently EOS lip balms taste really good—must be all that added flavoring). When we went on vacation, my girls used the balms for more than a week. Towards the end of the trip I noticed that their lips looked quite chapped. I attributed it to the fact that they were licking their lips a lot because the balms tasted good, and that they were possibly reacting to something in the water, air, or sheets of where were staying. They continued using the balms, and their lips continued to worsen in dryness and roughness, so I confiscated the balms (much to their dismay). Soon after we arrived home, I saw the news about the EOS lawsuit and the same allergic reactions others were experiencing. I’ve been making my family’s lip balms, as well as other skincare and personal care products for more than 5 years. Most them contain organic beeswax. No one in my family has reacted in any way to any of my beeswax containing products. I can say with great confidence that beeswax was not the culprit here. Is it possible that the beeswax was an issue for some people? Sure. Most people who opt to not use beeswax in their products do so because they prefer a vegan product. But I think there were far more likely suspects on the ingredient decks. 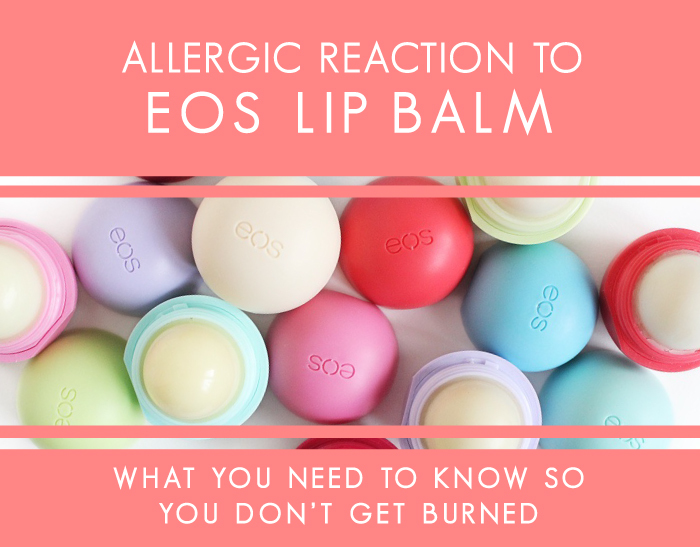 Were you one of the people who got “burned” by EOS’s lip balm too? Do you think they should have been under higher scrutiny by the FDA before going to market without appropriate warnings? Please tell me about it if you were in the comments below! Graphic design by Emily Blue. Rachael Pontillo is the bestselling author of the book Love Your Skin, Love Yourself and co-author of The Sauce Code. She’s a holistic skincare and nutrition entrepreneur, award-winning coach, product formulator, speaker, and educator. Rachael combines different holistic modalities to help people with skin conditions and self-image issues heal physically, emotionally, and spiritually so they can live their lives with joy and confidence. As a mentor, she helps professionals in the aesthetics and nutrition fields build their businesses and truly serve their clients in meaningful and sustainable ways. Rachael is the creator of the popular skincare and lifestyle blog Holistically Haute™, as well as the online course, Create Your Skincare™. Well, I used to use EOS lip balms a few years ago. In less than two months after I started my lips developed a terrible allergic reaction. At first I had no idea what was causing it, I thought it was something in my diet so I decided to cut a lot of things out. My lips got worse, blisters all over, cracking and peeling off way more than usual even during summer time, then the bleeding started, it was horrible and didn’t know what to do. I bought medicated creams for the lips but kept using the EOS lip balms still not realizing why I had such a horrible allergic reaction and then this happened; the lip balm I was using was almost finished so I threw it away planning to buy another one in the next coming days. Well, during the days I wasn’t using any lip balm my lips got actually better and the medication I was using for my lips started working. That’s when I realized it was the EOS products that I’ve been using that caused my lips to almost dissapear, it took me months to notice what was going on. Seriously, all of their lip balms completely messed up my lips and I was soooo addicted to them. Never again did I buy any of their products. I’ve been using Burt’s Bees since then and haven’t got any issues. I don’t know about their hand lotions and other products but their lip care line is a complete fraud. Be careful when using their products. I’m not sure how old this post is but my daughters teacher told her not to use it and I thought that was interesting. She said she had an allergic reaction. Then sometime 2 years ago my lips blew up and were five times the size. I threw the light blue peppermint one away and have never used it again. Best of luck to everyone! Actually, beeswax CAN cause allergic reaction. It is actually the compound propolis that is found in bee products – it is the “glue” that bees produce to build their hives. I found out after about 5 years of terrible breakouts on my face that were impossible to clear up that propolis was the culprit causing my pectoral dermatitis. I got it from eating honey! However, after I stopped eating honey and cleared up my skin (6 weeks of very strong antibiotic), I broke out again only to find out it was from a new, natural lip product I had started using. I now have to watch all products – hair, skin, makeup, and foods that may have honey contained in them. It IS caused from an allergy in my case. Yes I agree- not sure why there’s so much suspicion about the company and their disclosure about other ingredients. I can’t use anything from Bite Beauty nor a lot of lip balms like Carmex and Burt’s Bees, and there are even some lipsticks that my lips had reacted badly from—and the one common ingredient is always beeswax. It’s a known allergen and definitely should be considered as a culprit by anyone having adverse reactions. I used an EOS tube for the first time in December of last year and the only reason I hadn’t tried it before was because it came in egg-shaped container, the tube is much better sized and since I’m a bit addicted to chapstick/lipbalm I thought great, another variety. It only took a couple of hours since using it to start feeling my lips swell and that eventually led to severe peeling and rash, I never once thought about it being caused by the EOS. I stopped using the EOS and began using Vaseline because that is the only thing that helped control the peeling and the bleeding. Yesterday I found my tube of EOS and my lips were dry and without a thought I used it and within 15 minutes my lips were tingling and swelling, I found the culprit! Now almost 12 hours later, lips are still swollen and dry, so I’m back to using the Vaseline again. I know it is not the beeswax, I have no problem with Burt’s Bees, there must be something else and since I’ve used Stevia in foods, not sure if that is the cause or if it reacts differently due to it being applied topically. I’m going to report this to the FDA since I found their number on a website regarding a previous lawsuit that occurred in 2016. Wonder if I could start a new lawsuit? hmmm. For over a year I’ve dealt with a rash/blisters above and below my lips, super chapped, dry, peeling, swelling etc. I thought it was sulfates,so I stopped drinking wine, thought it was my cat, re-homed him, thought it was seafood, melons, etc. but never figured it out. Went to General doctor who put me on steroids to clear it up (even ran a herpes test lol). Went to an allergist who ran patch tests – nothing. Then went to a dermatologist who said to keep a food diary and gave special medicated chap stick. I had good weeks and then horrid weeks. It wasn’t until I had dinner with a friend that I mentioned my lip,problem (I was having a bad lip week) and she asked if I used Eos. Well I had a EOS at work and one at home that I would periodically use. I loved the taste! I never associated my rash/blisters to EOS. I went home that night and threw it out and the one at work too. It’s been over three weeks, still cold outside and my lips are so much better! This time I think I finally figured out my lip problem. Glad I can eat seafood, melon and drink wine. I do miss my cat though. The dogs and husband are happy. His new owner loves him so it all worked out. Wow, Jackie! That’s quite the story. I’m so glad your friend was able to be the one to uncover they mystery for you after all you went through. Thank you for sharing! Very similar to what I went through. I first used an EOS lip balm in March 2018, I used it for about 3weeks, and stopped because it seemed like my lips were more chapped. My lips were itchy and I had rash like blisters form on my bottom lip first then my top lip. And now it’s April 1st and I still can’t get rid of the rashy itchy swollen lips. I been using Vaseline like crazy. Carmex made them burn, so I just apply Vaseline almost every hour. I don’t know what else to do to cure my lips. People look at me crazy like I have fever blisters, but I know I don’t have them. I let my daughter use the EOS also and she loved it but I threw them all away! I need help…. Saw your post – have been having a flare up with my lips recently. I have a nut allergy and when I eat a nut, my lips break out AND I get severe indigestion for 8-10 hours. Not sure if the EOS is now a problem but I am commenting because I spoke to a doctor who labeled it “Contact Dermatitis” – allergic reaction to something topical. They put me on a steroid pill and within hours I had relief. Wanted to pass it along in case you too could find relief. At least your GP ran the test without just jumping to conclusion and marking your medical record permanently with a “sexually transmitted disease” despite emphatically disputing his assessment and letting him know that his diagnosis was impossible to be the cause and that he needed to take what I was saying seriously and look for other causes. Then he automatically wanted to jump to “an even worse diagnosis” [I can only assume he was suggesting HIV; he clearly had negative assumptions about any young woman that walked into his practice, disgusting, he was just DISGUSTING! ])He even wrote a prescription for whatever that herpes medication is without even knowing if his assessment was even correct, horrible medical practice! Needless to say I never picked it up and was not about to ingest something I knew would never help and who knows, most likely would have been dangerous. After running down the actual possibilities myself of the true possible cause, I realized that EOS was the only thing new, upon ceasing use and throwing it out, the rash began to clear within 24 hours, (but the chemical peel was just beginning). I called our regular GP to let her know what her associate did and asked to have the chart corrected, she completely agreed that it was not herpes [or worse], but instead an allergic reaction. However, she said could not clear the chart without now running a test because of the new medical reporting changes that came into play with the ACA! How is that for modern medicine, a completely backwards way to practice!?! So now medical practice is to make a diagnosis without any confirmed testing, but when it very clearly is the wrong diagnosis, one now must take a test to confirm they got it wrong, huh??? Makes you never want to go to another physician again with their horrible attitudes and lack of care and willy nilly writing out dangerous prescriptions for non-existant diseases that has now marred your medical record for life! (Don’t trust the statistics on sexually transmitted diseases knowing that they don’t really test, they just jump to false conclusions!) Now that’s a lawsuit waiting to happen on many fronts thanks to EOS! @Dee – that sounds traumatic! I’m so sorry their bed side manner was so terrible. I’ve never been thrilled by EOS but now I have solid reasons why! Great job with this info, Rachael! I’ve been suffering for the past 18 months following an allergic reaction to EOS lip balm. I had used it in the summer of 2016 and my lips started blistering and peeling as a result. I even developed excema on lips (something I’ve NEVER had before in my life). I’m actually undergoing patch testing right now and, yes, it’s officially confirmed that I’m allergic to EOS. I only wish I had seen this link before I ever started using the product. It’s been a year and a half of pure torture! Dealing with this now….I had not heard about the issues with EOS…and kept a stick on my work desk for months used practically daily with no issues. I found an egg shaped balm that was in my beauty bag that I received as a promo item from an event I was at and used it for the first time when the weather got cooler….my lips started to feel like sandpaper about a day later and didn’t improve. Of course I kept reapplying thinking it was the dry winter air….then one day I wokeup with swollen lips and blisters and that’s when I realized it could be the EOS. So, I stopped using and decided to try using Medicated carmex. Burt’s Bees…nothing helped . I tried Vaseline and that worked much better…one day I was in the car and my lips were feeling dry and all I had was a stick of Blistex by that night my lips were blistered again and oozing…I woke up with crusted over, itchy lips. I already have eczema and definitely think this is contact dermatitis……the only thing that helps is Vaseline. So, I will stick to that and NOT use any lip balms ever again. None of these reactions ever happened until I started using that EOS. So, I think whatever it’s made with started a chain reaction and anything that’s similar to that formula causes my skin to have an allergic reaction. My daughter, now 19 has an allergic reaction to EOS Lip Balm as well. She began using them often when they first became popular a few years ago. The reaction was not immediate but startled after a few months of continued use. Her lips became inflamed, red, chapped and blistered around the edges. At about the same time she was seeing a dermatologist for acne. The poor girl had enough to deal with and then this happened. It was I, her mother who eventually figured out the culprit was EOS. The dermatologist did not even ask about lip balms, etc. By process of elimination and after trying hydrocortisone ointments and such eventually the symptoms went away. It was a terrible ordeal. A few months later I saw the news articles about others who had the same reaction. Seeing photos ,etc confirmed what I had suspected. She will NEVER use the products again nor will I buy them for anyone else. Unbelievable! I’m 75 years old, NEVER had a problem with dry, chapped lips. I applied Chapstick during the day and plain Vaseline at bedtime, and all was well — until a couple of weeks ago when I bought a tube of Eos Organic Stick Lip Balm. After a few days, my lower lip became dry and cracked, and the skin began to peel off to the point that the lip bled. I could think of no logical reason for it to be doing that. Googled dry, chapped lips and up popped your report (and several others). Only then did I begin to suspect the lip balm. I’ve never been one to have many allergic reactions, but the timing was certainly right in this instance. Thank you so much for this post! About an hour ago I bought some EOS (first time trying it). The skin around my upper lip immediately got tingly and swollen, and now I have small red bumps in that area. I had no idea that EOS could cause this reaction until I did an internet search and came across this article. Glad I’m not the only one (but it’s awful how many people are suffering from this)! Burts bees caused a blister breakout, so quit using it and my lips healed..I just bought a vanilla bean Eos egg, and my lips are red, swollen and have weeping blisters on them..I do have an allergy to fake sugars, and Stevia gives me hives..could be additives, could be beeswax, who knows? A&D and neosporin seems to be the only stuff I can use on my mouth.. This might seem weird, but I really think it’s the Stevia. I know stevia is natural, but it’s also something that we haven’t been exposed to much until recently. I only came up with it because I had a reaction to EOS about a year ago and stopped using it. I figured it was one of the many natural ingredients even though as far as I know I’m not allergic to anything. Then last month I decided to use Listerine Naturals, the clear mouth wash. After a few days my lips started feeling the same as when I had been using the EOS. When I stopped using it my lips went back to normal. I looked at the ingredients for both and the only one they have in common is Stevia. It seems an odd coincidence. About a month ago, I started using EOS lip balm. I was slathering it on while sitting in ICU with my mom, throughout her funeral shortly thereafter, and couldn’t figure out why my lips were feeling so sore and puffy. There weren’t any noticeable blisters and they didn’t look freakishly swollen or anything so I chalked it up to mild dehydration because I’d been so busy with my mom, funeral planning, etc that I just wasn’t drinking enough water. As of two days ago, I have a sore on my lower lip. It still didn’t occur to me that it might be the lip balm until I went to apply it today and noticed a huge splotch of mold had developed right in the middle of it. Into the trash it went. Not happy. But at least I know it wasn’t my imagination and I’m not actually losing my mind. Oh man, what a story! First, my sincere condolences for the loss of you mother. I’m really glad though you’ve figured it and out and I hope this was helpful to you. If I were you, I’d also contact the company to let them know of the issue. Thanks for the comment, and I wish you well, Natasha. Just noticed that my top lip swells when I use EOS Lip balm! I’m beyond mad! I have to walk around with carmex slathered on my lips due to the allergic reaction from EOS! Hopefully this will pass quickly….smh. I have the exact same reaction when I use EOS. I have since thrown it in the trash. This is my first time on here and read so many stories and experiences I can totally relate to. I couldn’t help not to join and share.? I happened to receive one from a friend and it used to make my lips more dry, chapped, and felt like they were about to peel off. I have sensitive skin as well and it used to dry up my skin around it. Even under my nose area. I stopped using it and threw it away after 10(+/-5) applications in 15-20 days. I’m pretty sure it’s Jojoba Oil and after some research I highly doubt it’s pure Jojoba Oil. It must contain some additives or it has been refined too many times. I also had negative reaction to Balmi Lip Balm and Clarins Instant Light Lip Comfort Oil and they all contain Jojoba Oil, these two balm stripped and dried out my lips and they become very sore and aching but EOS gave me blisters! all over my mouth after just 6 uses! Oh my! I just found my EOS in a drawer a few days ago, used it and now I have blisters all over my mouth too. I sound like a wimp but it is really bothering me! I went to the doctor the first time this happened and they had no idea of what happened and neither did I. We even tested for herpes type 1 and it came out negative to my surprise. This time I know what did it. Is there anything you can do to make it go away? It is almost comparable to poison ivy. Apparently I am also allergic to EOS. I’d like a remedy. I work with the public and can’t miss because of weird lips. Please help. Yes! I now have been able to realize what is causing my horrible lip reaction I’ve been having for the past several months. I googled eos lip balm and saw that I’m not alone! I am wondering if those that are suing will be able to get answers to what exactly is the ingredient that is the culprit for so many allergic reactions. This would be so helpful so that those of us affected can avoid it in the future. Like many have already said, the blistery and oozing lip reaction lasts for almost a week. It feels horrible and ruins my entire week when it happens. Thanks for sharing all this info. Sure hope they win their suit and the ingredient is exposed! I’m having the same reaction as I did when I used a Burt’s Bees product several years ago. I contacted the number on the package and all the6 would tell me was to stop using it. I figured I was just sensitive to the natural oils in the product. But now with the same thing happening while using EOS, I am saddended that I again have to switch products. I will back to the glosses from Bath and Body Works. I started using EOS recently for a week and noticed that it made my lips more dried. Three days ago, my lips were swollen and cracking really bad where my lips were bleeding. I stopped using EOS on the day it was swollen only after my niece informed me about the class action lawsuit. I have used all types of lip balms before and never had problems with any of them. What could be causing my lips to be swollen and feel like sandpaper. My lips are red constantly and sensitive. I have used coconut oil before without any problems, so there is something else in EOS that is causing my lips to be swollen for days. What can I do to resolve my swollen lips? I have stopped using EOS 3 days ago and went and purchased a new lip balm called Cera Ve with the active ingredient of petrolatum. I hope this one will help relieve my swollen lips. Is this case still under investigation? For sure, never buying one again for anyone I know. I have a tree nut allergy and was unaware the EOS lip balm used coconut oil. I thought it was required by FDA to label products with allergens? I have used this balm for a few years but just recently started having an allergic reaction. At first, I had gotten dry lips that started to crack. I kept applying the balm, and I guess due to the open cracks the coconut oil was allowed a deeper penetration under my skin and caused the red swollen lips and itching. I have since switched to Aquaphor for my chapped lips which works wonders. I’m using EOS 6 months and now my mouth is itching what should i do? stop using? sorry for my english i am from poland. Thank you for sharing this! I bought this lip balm 3 days ago and my lips and the skin around them are swollen and red. They almost have a sand paper feel. 🙁 I am an avid chapstick user (borderline addicted) and I have never, ever had such an issue. I was using EOS before and suddenly one day my lips started burning, was swollen and little rashes all over. I did not suspect the EOS but stopped using it because I thought perhaps they started using camomile in there which I’m allergic to. Took me a week for lips to get back to normal. I was out of my usual lip balm and used some EOS I had laying around last week and Bam! Burning lips are back. Knowing that I used the EOS I went online and found out about the lawsuit and this article. Thanks! Now I realize I’m not the only person that have suffered from using this product. I’ve tossed them in the garbage but still dealing with unhappy lips. Ouch! I have very sore lips from using the EOS lip balm:( I’ve used it before,starting in 2016 at some point,and never “noticed”any negative side effects to stop.Reading the various experiences online,I think I may have always had “symptoms.”Yet they never got so bad where I can say I my lips hurt,even interior lip area at times reacted,never thought it was the lip balm.It started with what some people call “baby acne.”Then it spread to a red rash as i used more of the EOS thinking I just needed hydration.My lips haven’t stopped burning,and the rash is all around my mouth where my upper lip’s slightly swollen.I stopped using it now for about a full day,still sore.I have previously used Labello ,now Nivea where the “color”lip balm was quite drying,but I don’t recall this type of reaction.Polysporin lip balm was the last product about 6 years ago that affected my lips like the EOS,but my lips were really swollen with it. WHAT are these manufacturers putting in their products to cause allergic reactions from consumers?! The government needs to start doing something before complaints have to reach “high” levels for action. I have been using eos lip products for a while now. Now my lips are constantly burning and feel like they are on fire. I told my doctor she has recommended a dermontologist to help me now. My daughter got me an eos lip balm for my birthday in August. I had no problem with it at first. In September, I started using it more, because I’m a teacher, and talking all day, while being in a drier environment, made me feel the need for it. My lips got more and more chapped, and so did my mouth, which caused me to use the balm constantly. Yesterday, my lips were covered with tiny blisters, and I had 2 sores on my tongue. I mentioned it to one of my advanced art classes, as I pulled out the lip balm to apply it. One of my students said, “That’s what’s causing it! My mom had the same reaction!” I decided to look it up, and found so many others with the same experience. I realized that even my throat was sore! Today, my tongue and throat are already better since I quit using the balm immediately yesterday. My lips are still sore since they peeled to new skin. I’ve been applying petroleum jelly, and hoping they’re better soon. I am allergic to these as well, I applied a bit on my top lip and my lip started to tingle and get puffy. I did figure out it was an allergic reaction and it was very scary. I had to use ice cubes to stop my lips from hurting and puffing and that did help. I don’t recommend using eos anyways because they test on animals.. I used my eos i had and refilled it with a different one and used it like that. It works for me and hopefully I can figure out what i’m allergic to in the balm. when i meant it works for me, i was referring to the eos i refilled. My experience is similar to many posted here. I have been using EOS for months when all of a sudden my lips started peeling and they are extra dry along the edges. I thought I was dehydrated, so I started drinking more water and applying more of the lip balm. I finally figured it out and switched back to Carmex. I don’t understand how a product can start out working fine then turn bad! You don’t understand how because you don’t understand how sourcing organic raw materials works. Most organic beeswax in the USA comes from Canada. But they have winter and this source dries up during that time. During the winter, distributors have to source from other places like India. The formula for the lip balm is the same, but the place that some of the raw materials are grown can change. The new Indian supplier may refine their organic beeswax slightly differently, and the end result may be that their beeswax contains more propolis than the Canadian supplier. More propilis means more people will have an allergic reacion. The bees also are pollinating different varieties of plants. This changes the make-up of the wax and you may be allergic to one of those plants. Everything I just said is why this entire article is written out of ignorance. Cool you make lip balm. But where you get your wax and how it was processed are variables you are not taking in to account. So to say it isn’t beeswax is an assumption based on no actual evidence. It’s ok though because you said you are not a scientist, so you don’t have to be accountable. To the anonymous poster of this comment, it’s fine to disagree, have arguments about the information provided. While you you may even be totally right, please check yourself on your tone. This site will not support nastiness as there is absolutely no need for it in order to make your point, especially from someone unwilling to provide an actual name. I would have never known about the difference in beeswax..thank you for this comment, because some beeswax bothers me and some doesn’t.. I agree with this person. Some years ago, I was using Burts’ Bees lip balms for a good while and my lips just got more chapped, cracked and raw. Finally did some research on the ingredients and found that the formula had beeswax in it. I found some reputable information about propolis in honey and beeswax products and that it was not filtered out thoroughly enough from the beeswax in some products. Now that I searched around and found the little Vaseline tubs that do not have beeswax, my lips healed. Over the ensuing years, I have tried a variety of other products including lipsticks and balms that had beeswax and again my lips got chapped and dry and raw very quickly. Now that I seem to be sensitized to this, my lips and around my mouth and inside my mouth gets raw and dry and sore when I eat honey or use any honey related products. I do think that it is accurate what NameWithNoMan has said about the beeswax supplies. And once you become sensitized to these substances, you may have increasingly worse reactions with further exposures to these. I surely do. Oh my gosh, I’m so happy I found this article! I got the blisters after using eos for a couple months a while ago, stopped using it and my lips went back to normal. Today it was the only balm I could find and used it in a pinch and I have blisters already!! Unbelievable. Thank you for this article! A year ago my lips felt really sore and began to get extremely dry. I tried all kinds of lip balms with no relief. I was 17 weeks pregnant at the time and had just gotten out of the hospital because of heavy bleeding from a blood clot in my uterus. I thought maybe my excessively dry lips were stress related and my OB had no idea why it was happening. It took two months for my lips to get back to normal. Here I am a year later, and starting with the same symptoms again, only worse….painful lips, extreme dryness, tiny blisters, and itchiness. Guess what??? I started using EOS a few days ago and realized I used it for the first time a year ago! Wish I had googled symptoms of allergic reaction to lip balms sooner! Sadly, I too got blisters. Started as just tingly, but quickly got blisters and scabs. At the worst point, lips crusted and turned yellowish. When healing, the lips would drip saliva like crazy. Obviously had to stay home. I though it must be from sunburn and switched to Lipsyl. After 2 weeks, I went back to EOS last night and today I have blisters again, so decided to research it. Oof. Thank goodness I know what it is now. I just discovered over the past 48 hours that I am one of these people experiencing this reaction. I don’t lick the balm and have never had any bad reaction to chapstick in the past. I’ve even made my own beeswax chapstick. Nevertheless I never add flavoring and only prefer mint if it does have any flavoring in it. I’m really disappointed in the brand – Regardless of what the ingredient is – for continuing to label their chapstick as “hypoallergenic” obvioisly… it’s not. Pointing out that people have been using honey for thousands of years in skin products doesn’t mean people haven’t had a reaction when applying honey to the thinnest skin on the body for thousands of years. In fact, they may not. Lip balms are a fairly recent invention when it comes to beauty products. I understand you like honey so do I but if my lip balms contain honey my lips will be raw and chapped. Of course it is possible your children and other people are having a reaction to any number of the ingredients of EOS. In fact, doctors will point out that it is probable for people with allergies to have more reactions to products made with natural ingredients because it contains a pure and more concentrated form of the potential allergen. I’m not saying not to use products with natural ingredients, they are the type I prefer. I’m saying that they have the potential to not be as great for some people who have an unknown sensitivity to a natural ingredient in them which can be different for different people. Thanks for your comment–I have to disagree with you though. 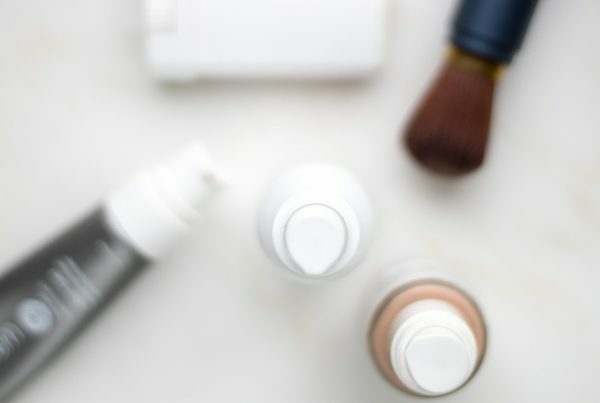 The majority of skin allergies and irritant reactions are from synthetic ingredients, as they are the ones that contain more concentrated isolates of natural compounds. Natural, whole ingredients contain different components that work together synergistically–isolating one component often makes it unrecognizable by the skin/body and more likely to cause a problem. My lips have been so dry and peeling for days and I couldn’t understand it. I’ve been using the coconut version of EOS at bedtime and maybe once during the day. I have not used it in a few days and my lips are back to normal. Hmmm…. A great & informative post! Great article. Thanks so much for sharing your personal experience. Hi Rachel, Im brazilian but currently living in Spain, in the cold winter I had been overdoing EOS lip balm and since 3 weeks ago the corner of mi lips started to itch, with dry and darker appearance. Then I stopped it cause I thought it might be too weak for that kind of winter dryness so I started using Dexpantenol to relieve it. Didn’t know about this lawsuit but is nice to know what was causing it. Thanks! This is so shocking to me because for the last 3 weeks my lips and my sons lips have been so dry and peeling everyday and I could not figure out why! We both used EOS! I’m a green beauty blogger and usually quite picky about products so I’m absolutely outraged that this supposed organic balm is what is causing my chapped lips! I even thought it might have been eczema because it’s been excessive! I will throw it away now and never use it again. Thank you for sharing this.